The difference between the two sides had been in West Coast's run and carry on the outside. They have created 95 more handball receives and 177 uncontested possessions allowing them to create ten more scores from turnovers. West Coast Eagles InterchangeDom Sheed replaces Jack Redden due to the blood rule. Even in the latter half of the final quarter, West Coast continue to find forward 50 targets. They have seventeen marks inside 50, which has translated to 8.6.54 from set shots. Last season, West Coast were ranked 12th for scoring from centre bounces. The addition of Sam Mitchell, who has had eleven score involvements has made a difference today with the Eagles launching 5.2.32 from this source. Fremantle have been far more effective from clearances in the second half. They have generated four goals from seven clearances compared to zero and from eleven in the first half. Since quarter time, Danyle Pearce has had a game high 356 metres gained. Despite winning just 3 less clearances, Fremantle has created just two more goals from stoppages. Nathan Fyfe has exercised his dominance in this area with six of their sixteen clearances. West Coast have completely dominated from centre clearances (136) and have taken full advantage creating five goals from this source. Michael Walters has had an impact for the Dockers from few opportunities. He has seven score involvements and five inside 50's from just 11 disposals. The grounds size has aided free flowing scoring this quarter. 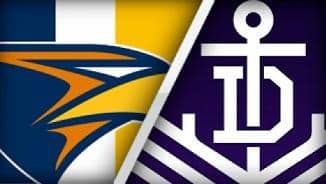 Fremantle has launched a goal from 60 per cent of inside 50's and West Coast has generated a goal from 40 per cent. A key difference between the two sides has been West Coast's ability to launch goals from clearances. From six additional clearances they have created five more goals than the Dockers. Josh Kennedy has recorded five goals against Fremantle for the second time in a preseason game. He also has four marks inside 50 and five score involvements. Since the first quarter, Fremantle have been more effective at transitioning from their defensive 50. They have launched two goals from five intercepts in this zone. West Coast ball movement enabled them to launch 6.4.40 from just 24 intercepts that half. 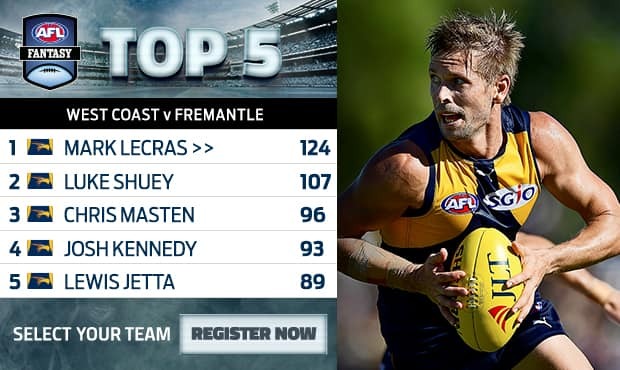 Mark Lecras was a standout with a game high 305 metres gained and eight score involvements. West Coast has amassed 96 more uncontested possessions and 13 more inside 50's. They have been efficient from their defensive midfield thisquarter, generating a goal from 60 per cent intercepts. That goal to Hayden Ballantyne was the Dockers first goal generated from 16 defensive half chains. Whilst, Nathan Fyfe has contributed valiantly with three centre clearances and two score involvements. In the previous JLT Community Series match, the Eagles created just five marks inside 50. Today they have eight and have been effective from set shots with five goals from seven opportunities. West Coast has created just two more intercepts across their midfield, but have launched 2.1.13 to 0.0.0 from this zone. West Coast utilized their centre clearance dominance and an open forward 50 to full effect in that quarter. They won five centre clearances, launching three of their four goals from this source. Sharrod Wellingham has continued on his form from last week with a gamehigh 8 uncontested possessions and four score involvements. New recruit; Sam Mitchell has been very effective with five score involvements from ten disposals. Fremantle has won four of the last five clearances. However, West Coast's disposal efficiency is 11 per cent greater and they lead the uncontested possession count by 46. Fremantle have created just one inside 50 from eight defensive half chains. In comparison, West Coast has transitioned swiftly launching an inside 50 from 60 per cent of defensive half chains. West Coast are dominating from centre clearances early on. They have won the first three centre bounces and have launched 2.1.13 from this source. West Coast and Fremantle were very different teams on offense in 2016. The Eagles generated a goal from 27.4 per cent of inside 50's. Fremantle were ranked third last, launching a goal from just 22.7 per cent of inside attack. In last week's 33 point loss to GWS, Sharrod Wellingham was a bright light. He had a gamehigh 19 uncontested possessions and 651 metres gaines as well as 9 makrs and 3 clearances. Welcome to Wonthella Oval for the West Coast Eagles v Fremantle Round 2 clash. 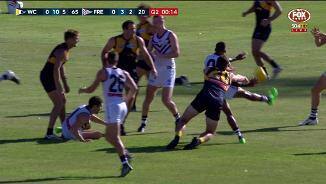 A SAM MITCHELL masterclass has given West Coast fans a mouthwatering taste of what to expect in 2017, with the champion midfielder inspiring the Eagles to a 55-point pre-season thumping of Fremantle in Geraldton on Saturday. In his first game in blue and gold after 307 appearances for Hawthorn and four flags, Mitchell's stellar debut overshadowed Dockers superstar Nat Fyfe's long-awaited return from a broken leg. Mitchell finished with a game-high 28 touches, but it was the creativity of his ball use and impact on a slick West Coast engine room that would have excited supporters most in the 0.16.11 (107) to 0.8.4 (52) triumph. Matt Priddis, Luke Shuey, Andrew Gaff all benefited from the 2012 Brownlow medallist's presence, while Lewis Jetta showed promise in a fast-paced contest played in hot conditions. 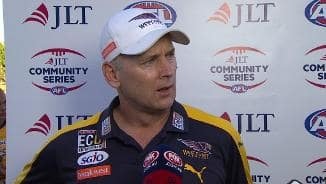 With ex-North Melbourne big man Drew Petrie also debuting in Eagles colours and competing strongly during stints in the ruck, West Coast coach Adam Simpson liked the chemistry of his recruits in the midfield. "There's no doubt they would've been nervous, I reckon today even though they're 300-game players, Drew and Sam," he said. "Obviously we've inherited a pretty good player (Mitchell). We're pleased with him and we're pleased everyone in the midfield today. "There's some experience there and the chemistry is starting to click too, which is pleasing." With a rampant engine room feeding dual Coleman medallist Josh Kennedy (five goals) and sidekick Mark LeCras (three), the Eagles had too much firepower and blew Freo away early. Mitchell had the first kick of the game and was everywhere with 10 disposals before quarter-time in the JLT Community Series clash at Wonthella Oval. West Coast piled on five goals in each of the first two terms and was never threatened after opening up a 45-point advantage at the long break. To their credit, the Dockers fought back after half-time, shaking off some rust in their first pre-season hit-out. While there were storylines all over the park for both sides, most eyes were on Fyfe in his comeback. 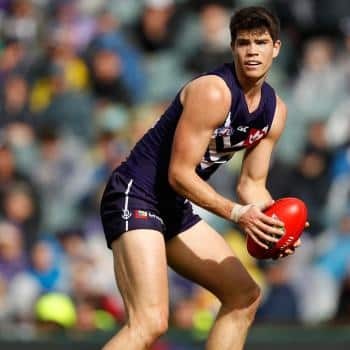 Playing his first game since round five last season, the new Dockers skipper started in the centre square and spent stints deep forward as he battled manfully in a losing cause. Fyfe racked up a team-best 22 touches, while Darcy Tucker and Stephen Hill tried hard, but Freo's onball division was swamped, losing the disposal count by a staggering 201 possessions (415-214). Michael Walters' electric pace worried the Eagles' defenders but he didn't have his kicking boots on, while his partner-in-crime Hayden Ballantyne bobbed up with two majors. Tall recruits Cam McCarthy and Shane Kersten (one goal) struggled for impact from limited supply in their first outings in purple. For McCarthy, it was a welcome return to action after the former Giant sat out last season to deal with mental health issues. 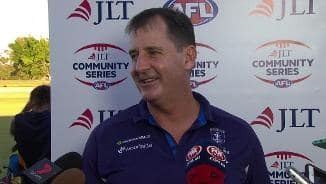 "If you think about it, McCarthy hasn't played in a year and a half, Fyfe's hardly played in a year and a half, (Michael) Johnson virtually a full year ... and (we had) some new players and some young players," Dockers coach Ross Lyon said. "Michael Johnson will get better, McCarthy will get better and Fyfe will get better. "I thought our second half was a lot better than the first half, obviously... we were on the back foot and we couldn't really get near them." Ex-Bulldogs premiership defender Joel Hamling had a tough initiation as a Docker, spending plenty of time on Kennedy and receiving little help from his teammates up the ground. 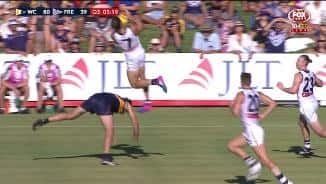 Triple-premiership Hawthorn wingman Bradley Hill slotted two goals on Freo debut playing alongside brother Stephen for the first time and got better as the game wore on. Hill provided a lighter moment in the final term when he tangled with Mitchell and refused to let his former teammate to get up, with both players sharing a quick embrace before running their separate ways. At the risk of repeating ourselves, Sam Mitchell's addition to the Eagles' midfield could be the missing link for Adam Simpson's side to push back deep into finals this year. West Coast's ability to get hands on the ball was a major failing last season and already Mitchell's presence looks to have tipped the balance back the Eagles' way, which will be critical after losing Nic Naitanui's dominance in the ruck for most, if not all, of the campaign. 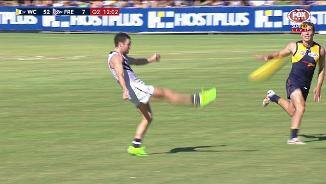 The Dockers were only playing their first pre-season game, so some rustiness from Ross Lyon's men was understandable. But there were promising signs. Although Nat Fyfe couldn't exert his usual influence from 22 possessions given the Eagles' control of the game, the superstar midfielder appears ready to again vie for the status of the game's best player. Freo's forward line was starved of opportunities, however Michael Walters was lively and looks primed for a big season. Sam Mitchell was brilliant when the heat was on early in the contest, and his chemistry with Matt Priddis and Luke Shuey in particular appears well progressed. Drew Petrie played as the back-up ruckman and was his typical hard-working self, while Nathan Vardy (one goal) continues to impress leading the ruck and with his willingness to get his hands dirty around the ground. Cam McCarthy and Shane Kersten found it tough to get into the contest given the Eagles' weight of possession, although Kersten did hit the scoreboard for his first major. Both should be better for the run. At the other end, Joel Hamling had it tough trying to stop Josh Kennedy with the flood of quality supply coming in. Bradley Hill didn’t get many chances to break the lines, but kicked two goals in an encouraging start in purple, while young ruckman Sean Darcy made a contest in the ruck in limited game time. The Dockers hit the road to Mandurah to host Collingwood in their second JLT Community Series clash next Saturday. West Coast has a 12-day break before facing Melbourne in the club's final hit-out before round one.